Marketing is vital if you want to attract new clients, increase salon profitability, and capitalize on business opportunities. It makes business sense to give marketing the importance it deserves. Take an honest assessment of your salon’s 2018 marketing endeavors. Was there an investment of time, energy or money? If the answer is no, start out by blocking out one afternoon each week devoted to salon marketing objectives, or hire a professional marketing agency to focus on promoting your salon for you. Is your brand identity looking a little tired? Are your business logo, fonts, colors and photography looking dated? What first impression does your salon create in the minds of your clients? What lasting impression does it make? To play a real role in the beauty industry, it is imperative that guests perceive your business highly. How would clients rate your salon? How do they perceive your salon brand? Do they have an opinion on the level of service provided? Will they stick with your salon? Details can make the difference between mediocrity and megastar status in the minds of your clients. “Brand” is the definition of a business in shorthand, because you can’t explain the who and the what of your business to everyone (that would be exhausting!). Your brand is your beacon, it signals and calls out to your potential purchasers so they can find you. What does your brand say about you? It speaks volumes without saying a word, good or bad. In a world littered with marketing noise and branding buzzwords, distinguishing your brand from the rest of the crowd is paramount to success. Branding is a lot like flirting. Imagine the power of a brand that can genuinely flirt and connect with people. Brand is the combination of creative communications tools that say who and what you are in a visual snapshot. These tools communicate your salon’s identity in the form of mediums such as font, color palette, pattern, images, and verbiage (voice). Branding is the creation of charm. How well is your salon brand communicated, does it leave a lasting impression on clients and guests? An up-to-date, well-designed website sends out the right message about your salon, spa or beauty business. Take an objective view of your salon website. Is it looking tired and dated? As technology, design and fashion/beauty trends quickly evolve a website designed over 5 years ago is considered antiquated. Images should look contemporary, the navigation clear with easy interface, and online gift card purchasing and online booking apps make websites money makers. If your salon’s website is in need of a makeover hire a professional agency that can customize the perfect website for your salon brand. Spread all your current marketing materials on a table and take a long, hard look at them. Have lots of marketing materials to makeover? Don’t tackle them all at once, instead, pick the worst offenders and work through them one by one. Updating your brand collateral is best handled by a professional design agency so all pieces are consistent and beautiful. The New Year is a good time to re-evaluate your salon social media pages. The message is clear, many users who follow you on social media hunting for great hair salon offers and promotions. Take your social marketing to the next level by hiring a professional marketing agency with the ability to mix-up the perfect combination of posts that include special offers, beauty trends, hair trends, tips and tricks. A goal without a plan is just a wish. 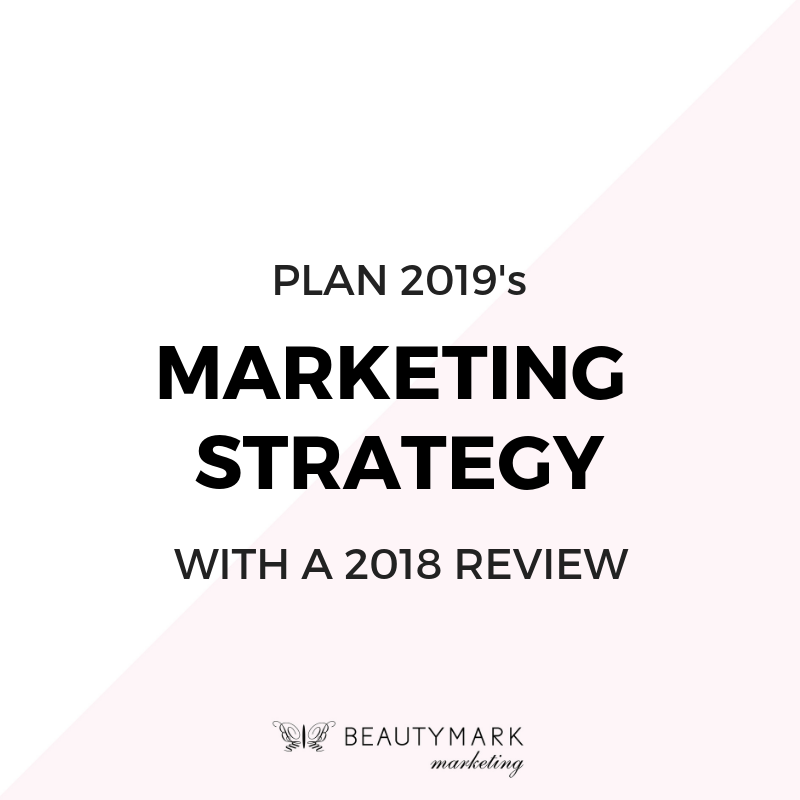 Investing a few hours at the start of the year to write a marketing plan for your beauty salon or spa can have a huge impact on profitability for the year to come. Before looking to the future, take a look back, appraise your business achievements in order to approach the new year with fresh objectives. Don’t be tempted to skip the evaluation step, taking the time for analysis allows for more-informed planning. At the end of this evaluation you should have a greater understanding of your business objectives and opportunities. > Did your business meet its financial goals last year? > Did most of your revenue come from existing salon clients or from new ones? > What percentage of clients only visited once, never to return? > Which are your most profitable salon services? > When did you last increase your prices? > What salon promotional activities did you do? > Is your salon website mobile friendly? > How does your site compare to local competitors’? > Has the site design or images become dated? > Is site copy easy to ready and professionally written? > Are you ranking high on Google so new clients can find you? When you deliver your marketing message using a variety of marketing channels you increase the likelihood of reaching your target audience. Repetition works. > What marketing channels are you utilizing? > Loyalty or Reward Programs? > Have you grown your email database over the last 12 months? > What incentives have you given guests to sign up? Don’t forget email contacts are one of your most valuable marketing assets. > Do you have salon marketing systems in place for retaining new guests? > Are new clients documented and followed up by your team? > Have you set up a loyalty or reward program? Analyze your top 3 competitors. Review their salon website, their social media, read their online reviews. > How do they compare to your hair or beauty business? > How do your guest services compare to your competitions? > What is the quality of your recruitment and training you provide your team? > What do your clients think of your guest services and salon services? > Take a look at look at complaints and feedback. > What message does the appearance of your salon send out? > Review your salon marketing materials (salon brochures, salon graphics, price and treatment guides, sidewalk signage, etc.). Are they on-brand and great selling tools or in need of a major refresh? What about your own marketing skills? Are you up to the task? Make marketing a business priority this year, invest in professional marketing services.